The historic candy maker (which stands for New England Confectionery Company) had been in operation since 1847 and was the oldest continuously running candy company in America. 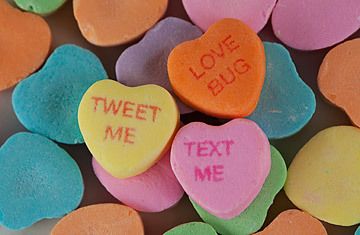 Less than two weeks from Valentine’s Day, we’re facing a mild catastrophe: We will not be telling each other “I Love You” or “Fax Me” or “LOL” with Sweethearts conversation hearts this year. There will simply be none for sale anywhere in 2019. The new company, who bought out NECCO simply didn’t have time this year to produce the annual 8 billion wafers…but promises they will return next year. Actually, however, the post today is not about valentine candy…no matter how good it is and how much we will miss it. It is about a “God shaped vacuum that resides in the heart of every person”…at least according to mathematician, physicist, and religious philosopher Blaise Pascal. 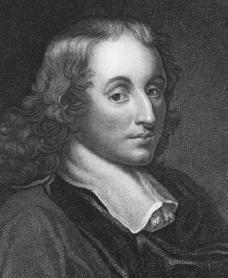 Pascal was born in France in 1623 and died in 1662 at the young age of 39. His father, a judge and tax collector kept his frail son at home to educate him. He believed in only educating Blaise in the classics…Greek and Latin…he was forbidden to study math…which meant, of course, that is all he wanted to study. At 12 he found a geometry book and after reading for a few minutes created his own proposition that the sum of a triangle is equal to 2 right angles. His father, realizing his son was a child prodigy…gave in to his son’s interest in geometry. By 16 he had written several essays and treatises on geometric theories, analytical geometry and physics. He made important contributions to geometry, calculus, and helped develop the theory of probability. Pascal’s law is the basis for hydraulic operations. At l9, he invented the world’s first mechanical calculator. The computer language known as PASCAL was named after him. It was during this time as he searched and struggled to find his own meaning of life and religious beliefs that he had a near-death accident. His two horses and carriage got away from him and went over the side of a bridge (over the Seine) almost taking him with them… but, at the last minute, he managed to escape and jump onto a busy street thus saving himself. Don’t we all see what happens when people try to fill that sacred vacuum with any man-made created thing…if we try to fill it with drugs or alcohol, jealousy or hatred, envy, self-arrogance, money, possessions, apathy, ungratefulness or greed. The list could go on and on. People fill this God-given sacred heart vacuum expecting much and receiving nothing…and we can’t figure out why? So until tomorrow…Let us remember God that “things” can never take the place of love…”things” can never take Your Place. 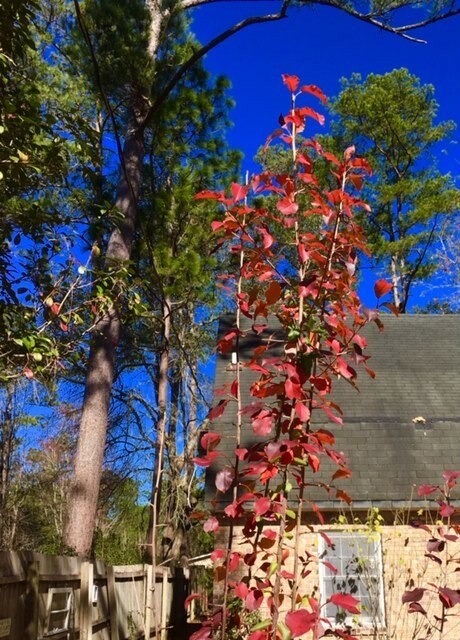 I know this tree-like plant looks really pretty so I took a picture before Luke cut it down ..he thinks it is called a ‘Prickly Something” …he sees them a lot in his work in forests and clearances. Even though the leaves are beautiful…the thorns that protrude from the stems are so long they are scary. It had to come down…it was potentially dangerous for the grandchildren who might be playing or running close by. 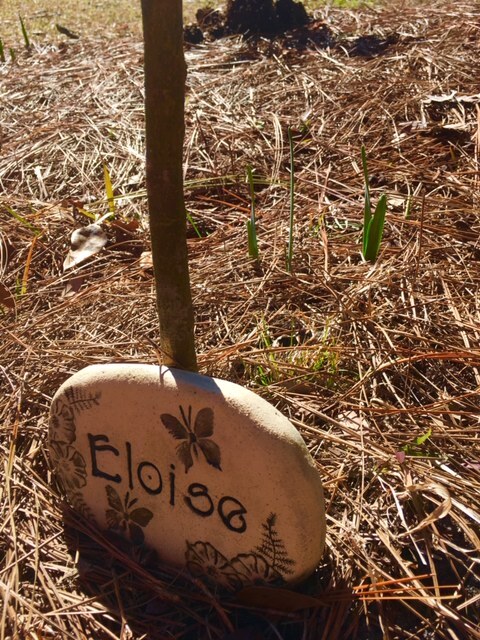 Besides…Eloise’s little Japanese Maple needs more room now because spring is popping up behind her small sapling…in the form of soon-to be daffodils. Sad to hear that NECCO has been sold! Both Bobby and I LOVE NECCO Wafers and usually have at least one roll on hand when we’re traveling – we devour them (me eating mainly the white and pink ones!) all at one time! As for the “conversation hearts,” I actually bought a package of them at our local CVS about a month ago. But the ones I bought were by Brachs – another good name in candy – and I think that’s what I’ve always bought. The sayings on the hearts were so faint we could hardly read them. I guess I didn’t realize that these were made by NECCO and we got the “wrong” ones. Something to look forward to for next year! Hope you have a wonderful Wednesday and that your foot just continues to heal and heal! Early Happy Valentines Day Sis! I am sure Brach’s must be racking up this year without its foremost competitor NECCO to contend against….one man’s loss is another man’s gain…such is life. That blue sky is picture perfect. I’m thinking the prickly thing may be a wild pear? Now that I think about it my lemon tree has gosh aweful thorns too. Isn’t there always a good and not so good side of most things in life..we must love the good and learn from the bad….as in beauty and prickly! I had heard that the company of NECCO was being sold. I am so glad the new owners will continue making the wafers we loved. As I said yesterday, my favorite blogs include stories from the past. No matter how many times I hear them, they never get old and always remind me how much history plays a part in the inventions and knowledge today. I don’t remember about Pascal’s conversion, but I just love the quote about “A God shaped vacuum in the human heart that can only be filled by God.” Again, thank you for starting my day with an inspirational message. I loved that quote too and it is so true…when man tries to substitute God’s love for us through drugs, money, or possessions…he discovers that there is no everlasting substitute for happiness when we rely on man and man-made creations over God’s….happiness is temporary and misery longevity.